Grim Curio is a writer, developer, and classicist from upstate New York, and the author of “Unmaking, Unmade,” one of our February games. 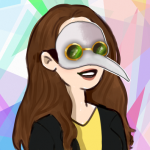 She is passionate about archaeology and the uncanny, and can be found on Twitter at @grimoirtua. This interview was conducted via e-mail in January of 2019.
sub-Q Magazine: Our theme for 2018 was love. What does love mean to you, and do you think that affected how you approached your game? Grim Curio: I love love, and I could go on about that for a while, but the main idea behind Unmaking, Unmade is that love can get pretty weird. Reading the jam prompt, my first thought was that “raw and unfettered” love can be something both intensely frightening and intensely tender. There’s something a little gory and vulnerable about that description, and I wanted to run with that while still conveying a real sense of tenderness deconstructed in what is otherwise a feverish infatuation with the unknowable. sub-Q Magazine: All the games for our jam were very short. What challenges did you experience trying to create something in such a constrained space? Grim Curio: I’ve been doing a lot of more longform IF lately, so the prospect of sticking to 1,000 words or less was very refreshing to me — but the shorter something is, the more I focus on polish. I agonized about every word choice, which made the first pass at a draft grind to a halt whenever I started to get hung up overthinking. I finally hit my stride once I decided I wanted to highlight the fast-forward/rewind theme, and then it became easier to choose and refine the language. sub-Q Magazine: What’s one thing you wish you’d known when you first started making interactive art? Grim Curio: I wish I had known a bit more about narrative design in general, but I think that’s always a learning process; making the switch from writing traditional static prose to creating IF has certain challenges. My first attempts at IF were very linear and very basic, and there are still some habits I’m unlearning, but once I started to enjoy taking more risks with scripts and CSS, more imaginative design seemed to follow. With each thing I make, I try to do something new in terms of mechanics, presentation, or just stuff going on under the hood. I try to learn new things at every opportunity. sub-Q Magazine: If you play a lot of games, what was your favourite new game in 2018? Anything coming out in 2019 you’re excited about? Grim Curio: 2018 brought a lot of great indies and AAA games, as well as some re-releases I was incredibly happy about, like Shadow of the Colossus and Okami. My favorite new release was probably Pokémon: Let’s Go; my cousin and I played Pokémon together when we were little, and it’s been special to get to enjoy a new-yet-nostalgic release together. In 2019, I’ve been eagerly awaiting the official release of Sunless Skies, which I backed on Kickstarter during its campaign; now that it’s out, I’m ready to throw myself even deeper into the High Wilderness. I’m also very much looking forward to Ooblets and the next Animal Crossing! sub-Q Magazine: What’s next? If you have any upcoming games, artwork, or other projects you want to talk about, let us know! Grim Curio: I tend to work on several projects at once, picking at code and assets between focused periods of writing; it helps me to avoid burning out on a single story. I’m currently working on a few major IF projects, one of which is a exploration game with a heavy dash of horror called Who Do You Think You Are, and another of which is a psychological horror narrative in a sci-fi framework called Heaven Alive. Both of these projects are standalone, but I’m also working on a multi-part series called Sacred Tides, which began with my ritual-oriented 2018 IFComp entry, Devotionalia. The next game in the series will be Heretic’s Hope, which will emphasize NPC interactivity and a new approach to ritual in an isolated setting governed by the vicissitudes of a ruthless insectoid court.